Ginger Chutney is a popular dish in Andhra Pradesh and is called as Allam Pachadi. This pachadi is a spicy and mildly sweet / tangy pachadi. 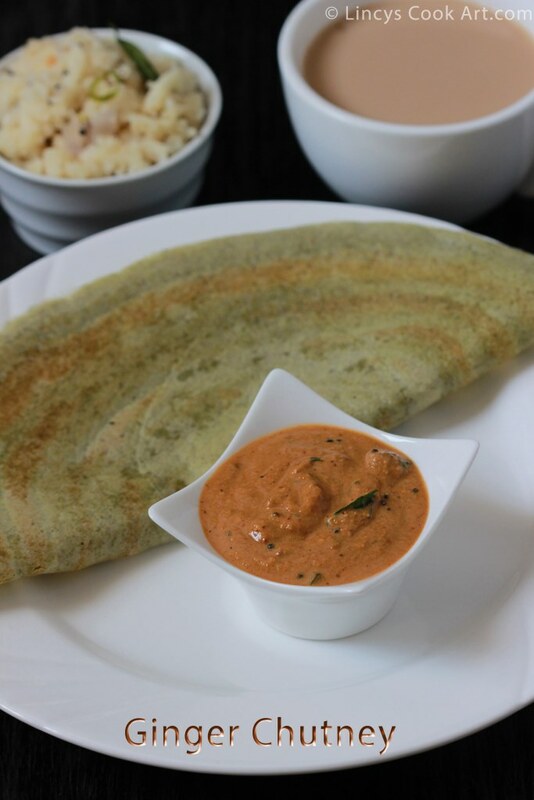 So tasty and it goes well with this Andra Pesarattu a instant dosa preparation. This chutney could be consumed with rice, idli, dosa..etc. Ginger Chutney is healthy and tasty it aids proper digestion. It tastes almost similar to the Kerala puli inji preparation which is also prepared using ginger. Try this for your Idli Dosas and relish your taste buds. Good chutney variation from the regular chutneys. Heat oil in a pan; add the channa dal, urad dhal, jeera, dry red chillies and roast in that oil. Once the dhal starts to get golden brown add the finely chopped ginger and roast in that oil till the cut ends of the ginger gets a golden colour thereby eliminating the raw flavour but raising the roasted aroma of ginger. Now add tamarind and roast for a minute; switch off the gas and allow to cool. Add all the roasted ingredients in blender jar and powder well. Add some water and make into a fine paste. For the seasoning heat oil in a pan and add the mustard seeds with dry red chillies. Once the mustard seeds crackle add the finely chopped garlic and curry leaves. Once the garlic becomes golden add the asafetida and switch off the gas. Add the seasoning on top of the ginger chutney and mix well. Note: Use sesame oil for more taste and flavour for this chutney.